his is the story of a very unusual individual: A dedicated professional and a creative entrepreneur. He is regarded as a strategist, determined and inventive (a natural born leader with great sense of humour, they claim) who has an equally impressive background. Passionate for design and a true lover of typography Clarke studied Type Design at Reading University and Letterpress at the St. Bride Foundation in London. The Head of Design at Microsoft EMEA before forming the digital agency, Thin Martian (a top 100 UK design company according to Design Week) today he is a dedicated follower of the letterform. “I specialise in illustrative type and lettering” he writes on his website. “My aim is to bring words to life and make them more vivid with decoration and imagery. The designs can be fun or serious, as long as they enhance the message” he adds. Jamie Clarke knows what is buzzing as he is exploring the endless styles and trends leading the type and lettering world though his very popular blog, Type Worship which has a following of over 200,000 typography enthusiasts. Part of the team behind the typography magazine, 8 Faces, created by Elliot Jay Stocks, Jamie Clarke now resides is Sydney where he is expanding his collection of lettering projects and typefaces. Typeroom wanted to know how it all started and Mr. Clarke responded kindly. It’s been a long journey! In a nutshell; I’ve loved type and lettering since studying graphic design. On graduating, I fell into a career in web design. Back then, font options were severely restricted and I was diverted away from my calling. After working at Microsoft and spending 10 years building my web design agency, the calling began to resurface. I started the Type Worship blog as a place to collect and explore the various styles of type and lettering that spoke to me. My passion was soon fully rekindled and the desire to focus on it was a contributing factor to me selling my agency. I started over. I took a number of courses to polish up my skills, like letterpress and screen printing and I spent two summers studying type design at Reading University. The course at Reading was life changing (I wrote about it here), and it set me on my current path. How has your background as Head of Design for Europe at Microsoft affected your typographic vision? Well, I learnt an incredible amount at Microsoft; designing for huge and diverse audiences, being creative with technology and the internal dynamics of large organisations. But I think these were more beneficial in running my own agency. Indirectly, the typographic restrictions of the web at that time, combined with the suppression of my passion for type have made me more determined to pursue my love for decorative lettering and typography. Why did you decide to refrain from the digitised world and focus on hand-crafted work? I really wanted to make things that would last. Things focused less on code and new technology and more on traditional craftsmanship: things that would still be around when I’m not. I’ve not forsaken my Mac by any means – it’s still an essential part of my workflow, but I’ve relegated it to my production process, not my creative process. I enjoy the immediacy of drawing with a pencil and when I have a vision in my head, the most natural way for me to capture it is with a pencil sketch. I then try and remain in that analogue mode for as long as possible; redrawing ideas and refining details until I’m ready to trace the design and create the vector artwork on my Mac. Like any tool, the computer leaves its own mark on the work, so by deferring its use I’m tying to limit its effect on my designs. Plus, the more I’m drawing, the more I’m investing in my illustration skills. Do you consider working with typography is a good way to learn and experiment? Yes. Tying to make type fit harmoniously into a design will inevitably throw up numerous challenges. Over time you’ll learn techniques and hone your senses to smooth these issues out. I had to re-learn everything I’d forgotten from design school; using a baseline grid, H&J settings, the spatial relationships between headings and body copy, etc. Now I’m more comfortable experimenting with type and enjoy breaking the rules. Some of my layouts include openings for drop caps at the end or middle of paragraphs, which is fun. However, at the same time I’ve strived to maintain the readability of the overall pieces. You’re currently living in Australia, having moved from your native London. Does travelling help to improve your skills? I think it certainly gives you a fresh perspective. I always have a notebook to hand on holiday, as my best ideas came when I’m relaxed, travelling and experiencing new things. I’ll constantly be doodling and writing notes. Living away from home (I think London will always remain my home) seems to have extended this aspirational feeling, even though I still have a work routine and day-to-day commitments. With regards specifically to Australia; a recent branding project I worked on required some illustrated lettering featuring native Australian plants. Some of them were quite alien looking, compared to the European plants I’m familiar with. It took a lot of experimenting before I could visualise them in a simplified and recognisable way but it was a great learning experience. Wow, there are so many. I follow the work of lots of my contemporaries and the blog is a great excuse to get in touch with them. I consistently love the work of letterers like Martina Flor, Seb Lester, Tom Lane, Ken Barber, Neil Secretario, Linzie Hunter… the list is endless. The most profound influence on my own work though has come from an assortment of master craftspeople; the foundry of Louis John Pouchée, William Morris, Alan Kitching, Herb Lubalin, Willy Fleckhaus (Twen Magazine), Michael Bierut, Phil Baines, Gerry Leonidas and Louise Fili. What is the best advice you have heard so far? ‘Clients buy what they can see’ is something I heard or learnt at the agency and this has been proven to me many times over. If you want to attract a particular type of work, then your portfolio must show examples of how a client’s project might look in that style. My spare time is full of projects that are pure indulgence but of course they also have this secondary purpose. The other comment I like is, ‘typefaces are never finished, merely abandoned’, which I believe is a play on what Leonardo da Vinci said of art. What specifically appeals to you about illustrative type and lettering? I’m most interested in what happens when you blend lettering and illustration. I enjoy both so my focus is to combine them in a way that explicitly depicts and enhances whatever context it’s in. Drop caps (or more accurately, initials) that did this of old are referred to as historiated and they had a dramatic effect on bringing a page of text to life. Similarly, I want to use lettering to make the reading experience more vivid and memorable but in a modern way. I’m progressively honing in on a few distinct ways to do this effectively. 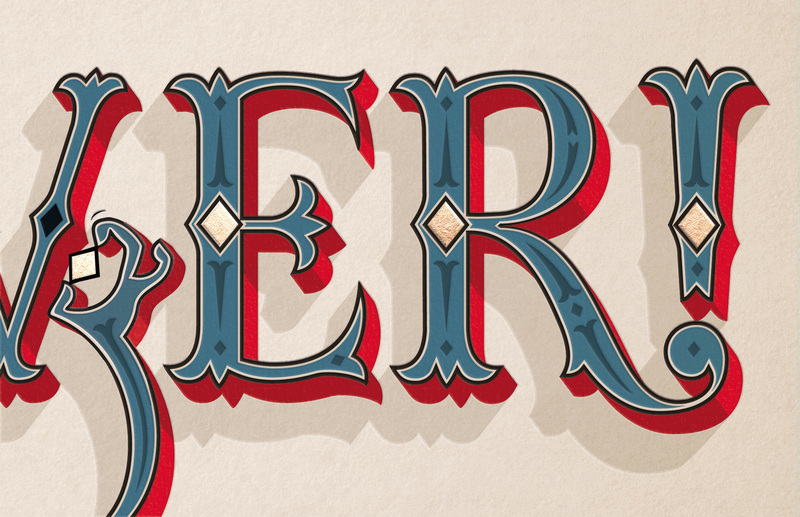 Through your Type Worship blog you explore the trends of the typographic universe. What’s hot? What’s not? Calligraphy, murals (the new graffiti), animated type and education are all hot topics. Over the last few years I’ve noticed that the popularity of various disciplines has slowly migrated towards the more manual crafts. When I first started the blog, typography was all the rage, then lettering was in vogue, now the trend is for calligraphy. This regression seems to be a natural conclusion, with writing being the genesis of lettering and type design. Personally I like to cover the broadest possible range of disciplines on Type Worship; from needlework and quilling (paper craft) to 3D printed and animated type. It’s all relevant and there’s much to learn in the overlapping methods. I imagine the trend for calligraphy will broaden and we’ll see it used across other mediums. I recently saw a furniture designer cast some script into precious metal for stool bases, which was cool. Maybe we’ll see a resurgence of stone carving? One thing is certain: we’ll continue to see the appetite for design education grow. Enthusiasts are looking within the community for helpful techniques, quality standards and inspiration. Calligraphy videos and Bezier curve screenshots seem to draw enormous interest. I’m hopeful that the widening popularity for developing these skills will prompt a rise in quality across calligraphy, lettering, and type design. My main goal is to expand my portfolio with illustrated headlines and titles, not just individual letters. I’ve a few designs in the works and I’m just trying out lots of ideas. Late last year I released a decorative, layered typeface, Brim Narrow, and I’ve just finished some combined versions, aimed at web use, that will be released soon. It took an incredible amount of work to complete the family but I’m keen to produce another decorative typeface in 2016. Other than that, I plan to keep looking, learning & writing. Oh, and cycling more!